I like it too! It’s one of many icons drawn by the talented David Lanham. He works for the iconfactory. that was a weird way to end a comic, having colin call some random name into thin air – who the hell IS pauline, anyway? So I guess… Colin’s starting to go insane? Maybe “Pauline” was the name of a childhood pet or something. Pauline is the paper doll’s name. The business Pauline comics are the best. i hate when people don’t get the joke (but i don’t hate the people, don’t worry). 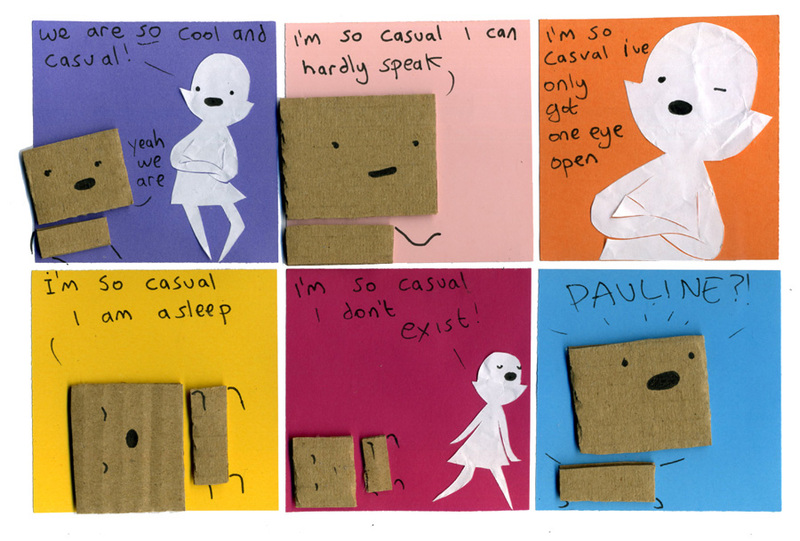 “i’m so casual i don’t exist!” “PAULINE? !” she doesn’t exist. so everyone’s saying she doesn’t exist. I actually like that. Hahahaha. What Pauline? There’s no Pauline!